Looking to kill some time and fill my belly, what better way to do that than to bike a couple kilometers to the downtown core and grab a late lunch at a food truck? Burn calories, consume calories – the endless cycle. 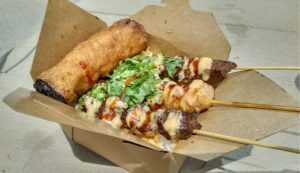 According to the Street Food Ottawa app, Angry Dragonz was one of the closer trucks to the north-bound bike lane on Bay, so I figured they were as good as any to try. Having seen their boldly-coloured truck around the city and at some events, as well as their fantastic looking food on Instagram, had made them one of my prime food truck targets. When I arrived at Gloucester and Lyon, the lunch crunch had already dissipated; there were just a few students ahead of me, but the masses of civil servants had turned back into khaki-wearing pumpkins at 1pm, and returned to their cubicles. Their menu was pretty big for a food truck, with a handful of starters, a couple of noodle dishes, and a few rice bowls as well. Seeing that they had the famous Ottawa burnt-end egg rolls on the menu, I knew I had to include one of those in my meal. The Dragonz Bowl seemed like a good way to sample their three different skewers – chicken, lamb, and beef – and was also an inadvertent shout out to one of the old school Chinese restaurants in my home town back east. In retrospect, Dragon Bowl Z would have been a cooler name, but no one’s perfect. I moseyed up to the window and placed my order for the Dragonz Bowl ($13), and tacked on an egg roll for a mere $1.50. Normally I don’t buy drinks at food trucks, but the combination of the heat, my cardio-intensive mode of transportation, and the potential for spice induced me to shell out for a lemon San Pellegrino ($3). After a short wait, the friendly truck staff soon passed me a very hefty container of food (bonus points, the container was compostable!). I walked my bike and food down the street and found outdoor seating by a nearby office building. Not wanting the egg roll to lose its crispness, I attacked it right away. The signature ends of the roll, which have exposed filling that gets charred in the frying process, added a great flavour. This was in sharp contrast to the closed-end egg rolls that I’m used to, whose all-carb ends are often overcooked and bland. The rest of the egg roll was crisp and flakey, and the filling was an enjoyable mix of lightly seasoned pork and cabbage. Next up were the skewers. Not being a huge cilantro fan, I brushed some of the generous pile off before trying my first skewer. Taking one of the red meats, I didn’t know which it was until my first bite told me that it was the lamb. It was wonderfully tender for a meat that’s notoriously easy to overcook, was seasoned with cumin, and got a little heat from the light dousing of hot sauce that I had given the bowl. While I had the lamb on the skewer, I mixed the chicken and beef into the rice and the Asian slaw. 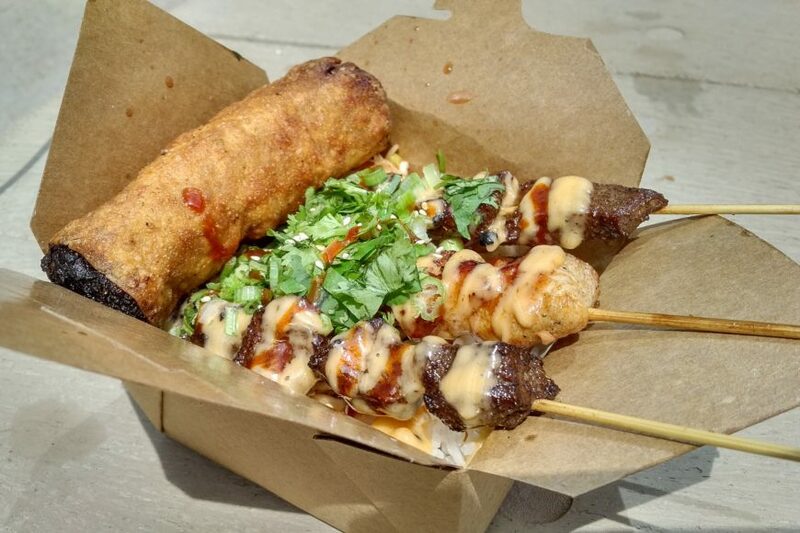 The chicken was some of the most tender I’ve ever had – certainly for breast meat on a stick – but some of the chunks of beef were overcooked and were hard to get of their wooden skewer. It was a small blip in an otherwise great meal though, as the tangy slaw of carrot, cabbage, sprouts, beets, and radish paired well with the grilled meat. Not to mention that this was simply a lot of food, and more than worth the price tag. My second visit came a few months later, after a holiday-truncated day at work. I had only eaten lightly at lunch to leave room for AD’s generous portions, so I ordered their beef bulgogi rice bowl, and tacked on two burnt-end egg rolls to my order – one for me, and the second to take home to my wife, who hadn’t tried them before. Their containers are compostable cardboard cartons in the style of take-out Chinese joints of yore, with a little metal handle for convenience. However, with the rumblings of my belly, the handle was not necessary – I dug in immediately. One of the first things I noticed was how much meat and veggies were in the container. Rather than cop out and fill it up with cheap rice, it was full of tender-crisp sprouts, cabbage, green onion and other veggies that got coated in the spicy/garlicky/funky gochujang (Korean chili sauce). The beef was in tender slices that were easily picked up in the chopsticks. While walking and eating on my way toward my bus, a couple of bewildered looking tourists stopped and asked me where I had gotten this food, as they had been looking for some street eats. It’s this type of interaction that tells me trucks other than chip wagons need to be open after the mid-afternoon, as both locals and tourists in the downtown want food choices beyond the big chains or generic pub grub. Don’t waste your money on over-priced poutines for lunch – Angry Dragonz provides a quick meal that’s not only better tasting and better for you, but from a place that uses z’s in place of s’s!